T-Mobile Name ID uses the power of our network to let you know who’s calling, decide how to manage calls—and stop unwanted calls. Qualifying service & capable device required. Enabling blocking may inadvertently block desired calls. Disable at any time. Info for some unknown numbers not available. Scam and spam call protection is getting even better. 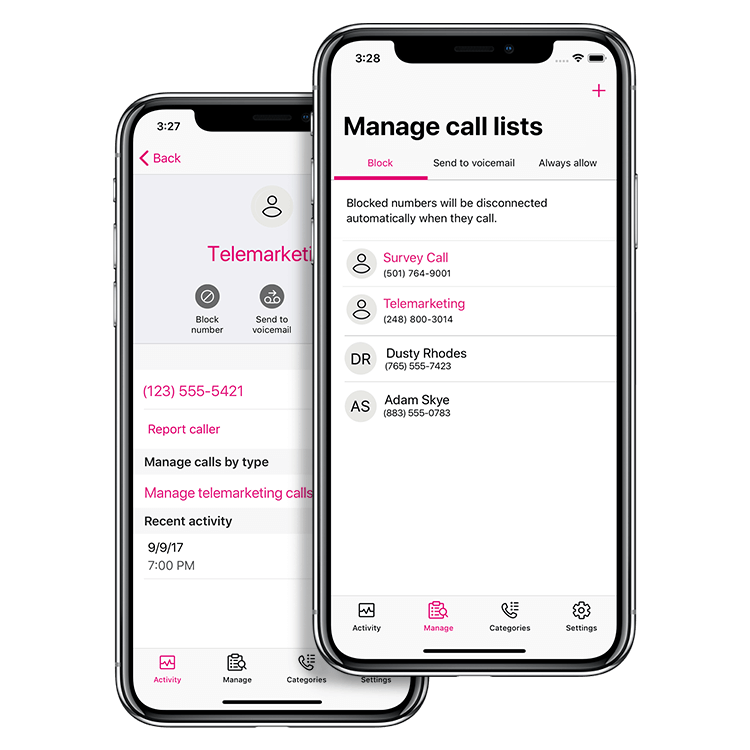 With our latest updates to T-Mobile Name ID, you can see the type of organization that’s calling, send directly to voicemail by call type—or block calls altogether. And your call preferences are stored on our network, so when you get a new phone, your settings are there. Know who is calling before you answer. T-Mobile Name ID combines T-Mobile and partner data to provide identification for incoming calls. Easily manage your call preferences in your application settings. Our block list now has its own area of the app, where you can easily block or unblock callers. Plus, calls can now be blocked on our network, not just your phone—so when you get a new phone, your calls stay blocked. You can also choose whether to receive notifications for calls that have been blocked or sent to voicemail. T-Mobile Name ID now delivers the user experience that users understand and expect. Robocallers, likely IRS tax scammers, and other nuisance or even dangerous calls are identified immediately, so you can decide whether to answer. Look up most phone numbers to receive contact information for people and businesses. Block all likely scammers before they reach you. Now included at no extra cost. How do I get Name ID? • Android users: Download the Name ID app from the Google Play Store. • iOS customers: First add the Name ID service to your account via myt-mobile.com or call 611 from your T-Mobile phone. Then download the Name ID app from the App Store. If you're running into trouble with the app, check out our troubleshooting tips.